We realise that the financial and legal aspects of starting and running a business can often seem daunting. 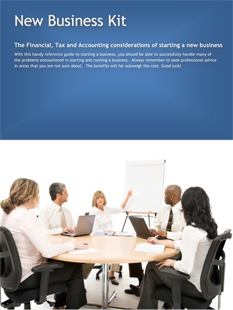 Therefore, let us provide you with a new business start up kit. This is full of useful information, such as: selecting a legal entity for your business, registering with the tax authorities, accounting and bookkeeping, VAT, payroll, income and corporation tax information. Fields marked with an * are required. Upon receipt of your details one of our accountants will contact you.